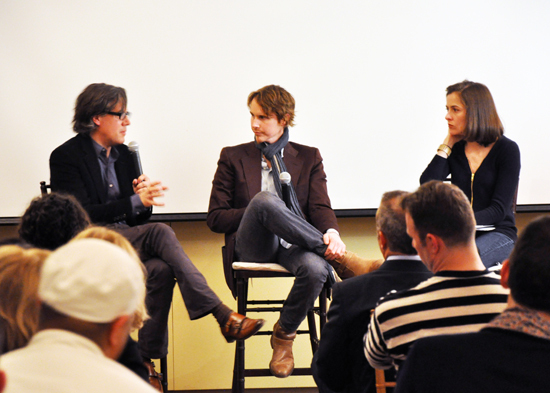 Achatz was in town to promote his memoir, Life, on the Line, co-authored with his business partner, Nick Kokonas. Both spoke at a panel moderated by food writer and food52.com founder Amanda Hesser and attended by chefs such as Peter Hoffman and George Mendes, media such as Jeffrey Steingarten and Melissa Clark, and a bevy of industry professionals and ICE students. Achatz, whose restaurant is seventh in the S. Pellegrino’s World’s 50 Best Restaurants—the highest ranked in the United States—won the James Beard Award for Outstanding Chef in 2008. He met Kokonas when the now former trader became a regular at Trio, where Achatz first showcased his unique cooking style as executive chef, and offered to build a restaurant with him. “You need commerce to make the art, and vice versa,” Achatz said after Kokonas pointed out that Achatz has much more of a hand in the business side of the restaurant than people think. Kokonas also said that people are surprised to hear how often the two talk about food together, as the pair explained how their collaboration works. Kokonas pointed out that Achatz could not create the food he does without a lot of infrastructure. Even though Kokonas never interferes with what Achatz puts on the menu, the two jokingly acknowledged that anything Kokonas doesn’t like seem to disappear from the menu after a few days. Achatz spoke of Alinea as a place that never feels like work, only like passion, as he spends 16 hours a day there with a staff of 65 dedicated to serving the 64 diners the restaurant can accommodate at a time. This unusual ratio is essential to the highly interactive dishes served at Alinea, where currently a dessert course consists of Achatz and a cook laying out the components of the dish on a silicone mat that covers all 48 square inches of the table directly in front of the guests. Achatz and Kokonas will open two establishments in Chicago, Next and The Aviary—a cocktail bar that will do with drinks what Alinea does with food—by the end of the month. At Next, the menu will be completely reinvented every three months, and focus on different styles of cooking and time periods. The opening menu will take diners to Paris in 1907, with classic Escoffier-style food as interpreted by Achatz. “The guy can actually cook; it’s not smoke and mirrors,” said Kokonas with a laugh, since Achatz made his name with revolutionary techniques and is primarily known for his experimental cooking. Achatz, who spent several years working with Thomas Keller at the French Laundry and spoke fondly of his mentor throughout the evening, stressed the importance of establishing solid foundations. This post also appeared on Diced, the official blog of the Institute of Culinary Education, with photos by Stephanie Bourgeois.